In 2004, MetaEfficient.com pre-reviewed the AeroGrow aeroponics growing system. That was before the system was released. A couple of years ago, you couldn’t cut on your TV without seeing an ad for AeroGrow indoor gardening systems. It isn’t as ubiquitously advertised now, but it hasn’t disappeared from the market. In fact, five years after its initial release, there are several AeroGrow systems for consumers to choose from. Now that the AeroGrow system has been tried and tested, how has it fared? 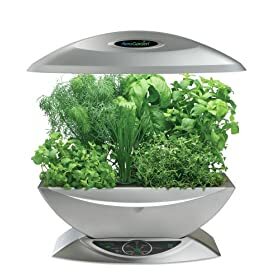 The AeroGarden 6 with Gourmet Herb Seed Kit , available from Amazon.com in three spiffy colors (white, silver, and black) for $132.39, “lets you grow abundant herbs, greens, or vegetables for your family 365 days a year in the comfort of your kitchen. No gardening experience or even dirt is necessary,” according to the product description. One of the big draws of the AeroGrow products is that they use a dirt-free means of growing herbs, vegetables like lettuce and tomatoes, and flowers. Aeroponics systems are like hydroponics systems, but the primary growing medium is air instead of water. Another advantage of the system is that it is compact and self-contained; it seems ideally suited for people with small yards, or no yard at all, who still want the advantages of a kitchen garden. Because the AeroGrow products are self-contained, including providing light for whatever the owner wishes to grow, the AeroGarden 6 and its sister products can be used anywhere, year-round, without access to windows that traditional indoor gardens require. AeroGrow lets you take windowsill gardening away from the windowsill, and thus offers a convenience and efficiency to would-be gardeners that traditional methods do not allow for. Seeds and nutrients are provided in pre-packed pods, included when you buy the AeroGarden 6; plug the seed pods into the system and watch it grow. You provide the water for your pod-plants — made easier by an alarm system integrated into the AeroGrow system that alerts you if your plants need water or nutrients. AeroGrow has provided a foolproof means for indoor gardeners to grow vegetables, fruit, and herbs with minimal fuss and no muss at all. The AeroGarden 6 differs from the original AeroGarden system in that it contains space for six plant pods instead of seven, which allows more room for your plants to spread out and get comfortable. Setting up the system is reasonably simple, and getting down to the business of growing is easy since everything you need to grow is provided. While the product is advertised as being quiet, its water pump actually makes quite a bit of noise, more even than a fish tank. The light is also quite bright. You will want to take these factors into consideration when you are setting up your AeroGarden. Perhaps the bedroom isn’t the best place to keep your AeroGarden 6. The noise and the light seem to be the only faults of the system, though. It works exactly as advertised, handily growing herbs (or whatever pods you’ve installed in the system) with no hassle and very little tending at all. The nutrients provided with the system seem to give the plants a little boost that results in surprisingly fast-growing herbs. If you have limited space, you might try the AeroGarden Space-Saver 6 with Gourmet Herb Seed Kit, which provides six spaces for seed pods in a more compact form with a slightly smaller footprint than the AeroGarden 6. This system comes in white, black, silver, and black with stainless steel accents, and sells for $149.95. It, too, comes with all you need to start growing, including seed pods and nutrients, as well as light bulbs. Again, the growing system seems virtually foolproof, as plants sprout and thrive with little effort on the gardener’s part. This system, too, though, is quite noisy and bright. For people with an out-of-the-way place to put the system, this shouldn’t be too much of an issue, since it is so self-contained. But if your space is limited, and you have nowhere to put the system but in an area where you’re likely to spend a lot of time, the biggest across-the-board complaint about the system is how much noise the pump makes and how bright the light is. You can cut off the light, but there is no mechanism for turning off the pump. 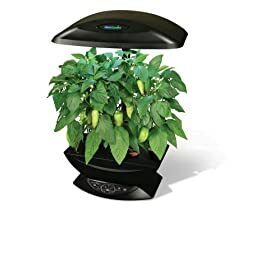 The AeroGarden 2411-00B AeroGarden Deluxe with Master Gardener Deluxe Kit, available in black from Amazon.com for $216.68, has considerably more bells and whistles than the AeroGarden 6 and the AeroGarden Space-Saver 6. While you can buy other pod packs for various of the other AeroGrow systems, so that you’re not confined to growing the included herbs in your AeroGarden, the AeroGarden Deluxe comes with an upgraded light system, a trellis system for larger plants, an attachment that allows you to grow full-sized vegetables like cucumbers, tomatoes, and peppers, and a full year’s supply of Grow Pods and the nutrients. You should note that while this system will accommodate plants beyond herbs and flowers, the seeds are NOT included with this system. The AeroGarden Deluxe is, like its smaller siblings, attractive and easy to set up. The pump again loses points for noisiness, and the three-bulb light system (the others have two bulbs) means the light on this model is brighter. But this system is as self-contained as the others, and performs as well; plants germinate and grow quickly, and there is a high success rate in the plants that grow with this system that isn’t present in traditional gardening. The fact that with the deluxe system, a gardener can grow fruiting vegetables, rather than just smaller plants like herbs, is a big bonus, and seems to make it worth the price. For a slightly lower price point, you can get the AeroGarden Pro 200 with Master Gardener 1-Season Kit and Gourmet Herb Seed Kit . It has fewer bells and whistles than the AeroGarden Deluxe – no trellis, for example – but still has the upgraded light system and more advanced features than the less expensive, more basic AeroGarden models. 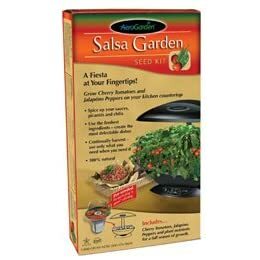 This model, like the AeroGarden Deluxe, comes with the Master Gardener 1-Season Kit, which enables you to grow your own seeds rather than relying on the proprietary seed pods that the other systems use. And the AeroGarden Pro 200 comes with herb seeds. This model has space for seven pods, rather than the six in the other systems. There are fewer complaints about a loud pump with the AeroGarden Pro 200, but the lights are quite bright on this system, as well as the others. The growing results, however, are as unmistakably foolproof and efficient with the AeroGarden Pro 200 as with the other AeroGarden products. Though the grow bulbs , nutrient tablets , and seed kits for the various AeroGarden systems are proprietary, they are relatively inexpensive and easily available. And because of the happiness of many of AeroGarden’s customers with the product’s ease and efficiency in providing an effective small garden even for those without the resources to grow a traditional garden, it seems unlikely that the company will evaporate any time soon – so if you buy an AeroGarden system, you will probably have no problem at all stocking up later on refills to keep your system growing. For people with smaller budgets or smaller spaces, smaller AeroGarden systems are available. If, on the other hand, you want to upgrade a larger system, upgrade kits are available to let you do just that. The consensus on AeroGarden systems is that they work well, and that if you buy a system, you will be assured of low-maintenance garden goodies, in a small space and with a minimum of effort. While the systems are not flawless – the bright lights and the loud pump being the most consistent complaints – they do offer, for people who can overlook those faults, a means of growing kitchen herbs and vegetables (and flowers, too) year-round, indoors. The produce from the various systems is consistently as the manufacturer advertises, and the systems have received consistently positive reviews in the five years since AeroGarden came onto the market. That this high-performing gardening system comes in a range of prices and with options to suit the varying needs of indoor gardeners is an excellent bonus. The range of AeroGarden products seems to be a cost-effective and highly efficient way for the would-be gardener to maintain a practical and productive kitchen garden indoors. Seems a bit pricey but I sure love the idea. The self contained nature of this appeals to me. I did read an earlier comment who complained it is too noisy. DON’T LIKE anything noisy. Like Bathroom fans…. make my skin crawl. Love the innovative solutions offered to the urban grow market. There are over 20 different types of seed kits to choose from, including herbs, salad green, chili peppers and cherry tomatoes. This product would be great for the winter. And not to mention how much energy and time one would save. I think this is a great product and its great way to live green. I am going to try the seed starter kit this year. It holds 72 little pots. It would have to be neater then messing with the peat pots like I did last year and then some of them died anyway. As far as the light bulbs costing a lot of money to run I have to say it lights up my kitchen and enough of my family room so I dont have to turn on other lights. Kind of like ambient lighting. The lights and pump run based on the plants being grown. Not necessarily 24 hours a day. Right now I have the herb garden growing and the pump is on for 16 hours, very quietly unless the water gets low and then it sounds like a little fountain so even that is not bad. Definitely not cost effective OR inexpensive. 20 bucks for the seed kits?? I could get hundreds, maybe 1000 seeds for 20 bucks instead of 6 “seed pods”. And 200 bucks, I could make on from instructables.com for a LOT less. I do have one however, because it’s a cool product and lazy. It’s not too bad, one thing to consider too. It will leave lime deposits (white flaky stuff) all over it just like a fish tank if you have bad water (most everywhere you do). Interesting review. I’d like to see how this would compare with plants in a pot (with dirt) with a regular compact fluorescent, or a slightly more expensive ‘grow-light’ fluorescent. This winter I brought in two green pepper plants from the garden and put a regular compact fluorescent bulb in an old lamp. I hung it over the peppers and turn it on for about 4 hours a day in the evening. The peppers I’ve harvested this month (February) have been quite small, but it’s been producing all winter. All with a $3 bulb and the electricity to power it (4 hours a day). Granted it’s not as upscale as an Aerogarden but it works. I bought one and returned one month later after I saw my electricity bill. I hadn’t had it long enough to say whether its a good buy or not. The machine uses two 25-watt light bulbs. The two bulbs run 18 hours a day but the water pump runs 24 hrs nonstop. So that’s like having a 50-watt light bulb running 24-hrs a day seven days a week. I’ve been contemplating getting one of these for growing veggies during the long winter months. Very informative review — thanks. I read your “article” about the Aerogarden. It reads more like an advertisement. I am disappointed in the article not the Aerogarden. I have had one for over a year. I use it during the winter months. The light and noise are not too much of a problem for me. I keep it in the kitchen. My main questions about it are how much energy do they use, and how does that compare with the amount it produces. Are the chemical tablets healthy. I do find the greens have a bit of a chemical taste. I am currently growing herbs and just use the pump with natural sunlight. I figure I am saving on energy by not using the lights. I love the herbs. Last year I grew the salad greens. Those were good too. But it would be nice to have more sound statistics on the use of the Aeorgarden, how much it costs to run, how much it produces, and so on. I don’t understand how you can call any of these systems “cost-effective” ? !